When the driver of an 18 wheeler, big rig, bus or commercial vehicle operates and drives under the influence of alcohol or drugs and causes an accident, California law holds stiff penalties including fines, loss of license and jail time for the driver. If you’ve been injured in a big rig crash caused by DUI or someone under the influence of drugs, you have a legal road forward for the justice and financial compensation you deserve. 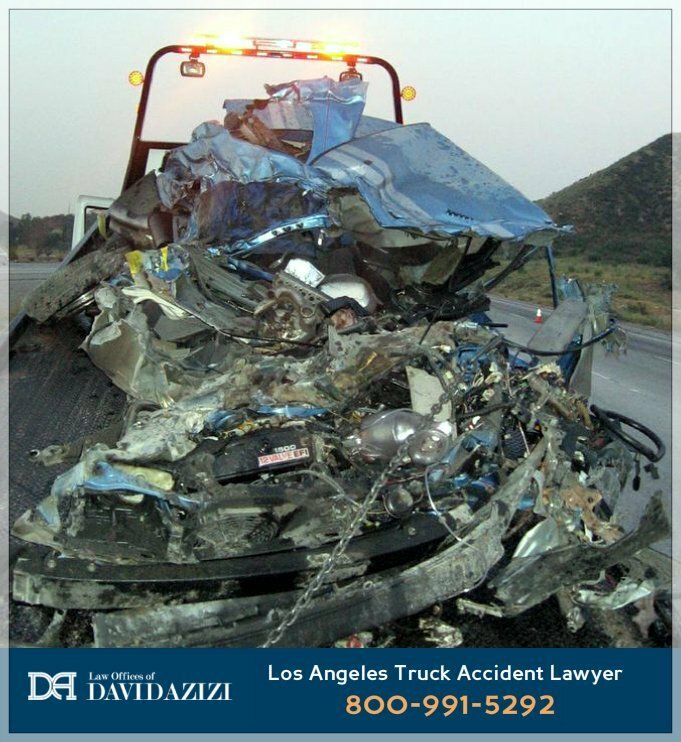 Los Angeles truck accident lawyer David Azizi will fight to make you and your loved ones whole again in the eyes of the law by making these drivers and the companies that represent them pay the money damages they owe. The duty of care required from truck, bus and commercial vehicle drivers is higher than the standard for other non-commercial vehicle motorists. This is demonstrated of course by the requirement to carry a Commercial Drivers License (CDL) and to receive additional training and certification. These are huge powerful vehicles capable of massive destruction and even wrongful death. 0.08% or higher ― applies to drivers over 21 years old operating a standard non-commercial passenger vehicle. 0.04% or higher ― applies to all drivers operating a commercial vehicle (semi trucks, buses, delivery vans, etc). 0.01% or higher ― applies to drivers under the age of 21 operating any kind of vehicle. These BAC levels apply to alcohol use, use of standard over the counter drugs, prescription medications, street drugs and any drugs that contain alcohol in them. When a driver is impaired in their duties behind the wheel because of alcohol and/or drug use, they have committed an act of negligence. That means they have liability (fault) for the accident and injuries they have caused through their poor decisions and behavior, and will be responsible to “right the wrong” by paying money damages to injured parties and their families. If the accident resulted in death for any of the victims, Federal law requires the truck or bus company to perform an alcohol and drug screening within two hours of the incident. This required testing also applies when police officers get involved, issue a citation and note that the crash included any bodily injury requiring medical transportation and treatment and/or when a vehicle is damaged to such a degree that it requires towing from the accident scene. The Law Offices of David Azizi will seek all medical records, police reports, and reports from the truck or bus company to demonstrate and establish that the commercial driver was at fault and prove negligence caused your accident and injuries. Anytime a trucking company does not follow through with required BAC testing, or cancels the testing, they must provide compelling reasons for taking such actions. A refusal to conduct a test may be admitted in court to demonstrate the intent to cover up DUI for their drivers. Armed with these facts, our truck DUI law firm will make our demands from their insurance policies, which have minimum coverage amounts. The legal action we take against a driver who has been accused of DUI are very similar to many negligence cases we pursue. We will establish liability of the driver and company and will pursue money damages for you. Our clients can quickly amass huge debts from all angles after a DUI accident with a commercial vehicle. Anytime a large commercial vehicle causes injuries or death, our team knows the case could be very complicated, require the assistance of forensic experts and could mean that millions of dollars are on the line. In the video below, Los Angeles truck and DUI attorney David Azizi describes a truck accident case against Budweiser where a verdict of $4.5 million was awarded to his injured clients. Watch the video below. Head on Freeway Collision Personal Injury - Accident Lawyer Verdict of $4.5 Million"Law Offices of David Azizi - 1-800-991-5292 Head on Freeway Collision Personal Injury - Accident Lawyer Verdict of $4.5 Million This was a tragic accident that involved a Budweiser 18 wheeler driver. He was trying to swat a bee or an insect out of the cab of the truck and he did not consider the road while this was happening. He ended up causing a head on collision that killed the driver of the other vehicle. David Azizi helped the family receive compensation of $4.5 million." It’s important to note that these complex cases involve circumstances that are unique to every case. What they often have in common is negligence on the part of the driver, which includes acts like distracted driving (texting or eating), driving over allowed hours leading to fatigue, and of course, driving under the influence of alcohol and/or drugs. How Much Is My Commercial DUI Accident Case Worth? We invite our clients to familiarize themselves with the truck crash injury calculator which can give you a very basic estimate of what your financial compensation might look like in a truck or bus DUI claim. The best way to determine your case value will be through a free and thorough case review, available by calling us 24/7 at (800) 991-5292. In the review we will evaluate your claims of wrongdoing, explain current California DUI laws, and will calculate the amount of money damages you may be eligible to collect, including pain and suffering. We need to hear your important and unique story if you’ve been injured by a big rig, tractor trailer, bus or other commercial vehicle involving DUI. We urge all injured victims to call us at 800-991-5292 as soon as possible. The deadline for filing a lawsuit after a major truck or bus crash is known as the statute of limitations. In California, that will typically be two years from the date of the accident. However, whenever a government entity is involved (like a city bus), that timeline shrinks to six months. When in doubt about deadlines, reach out and get your questions answered through a free case review. David Azizi and the truck and bus DUI team hold a 98 percent winning track record. We front the legal costs for all clients using the contingency fee structure. That’s the “no win, no fee” system common to personal injury law. That means only when we win you case and collect compensation for you do we get paid, via a percentage of the recovery. If we do not win your case, you do not pay. We assume that risk based on our solid history of success in representing injured victims. 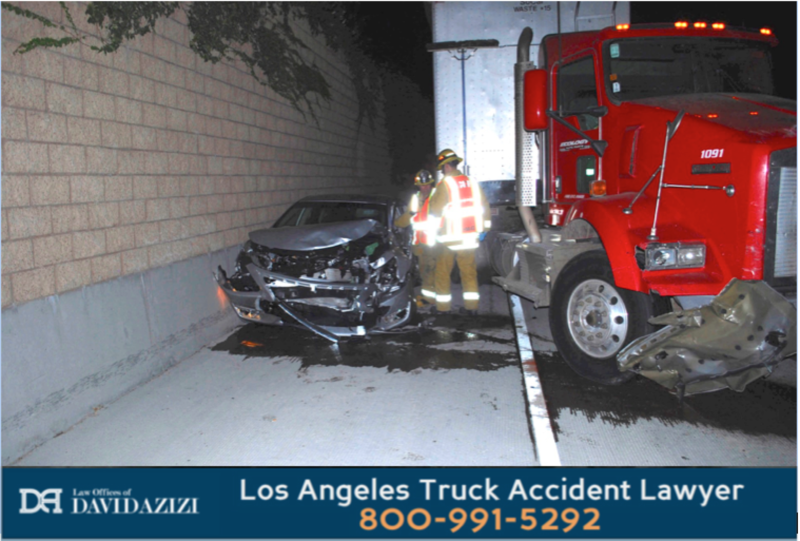 If you are ready to pursue your claim of wrongdoing for DUI involving a truck, bus or large commercial vehicle, Los Angeles big rig accident attorney David Azizi and team are standing by to begin work on your case. Call us 24/7 at 800-991-5292 or fill out the form on this page and let’s get the justice and compensation you and your loved ones deserve.